We were pleasantly surprised by this park. 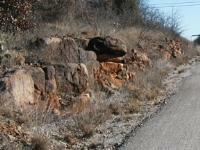 Nowhere, does it indicated the beauty of the rocks bordering Lake Mineral Wells. Hiked from Mineral Wells to Weatherford. This is a great trail for conditioning and building stamina. I started at the Mineral Wells trailhead at 7 a.m. and made it to the Garner trailhead in 2 hours and 45 minutes. Make sure you bring plenty of water as there aren't many places to refill along the way. In Garner there is a store and restroom facilities. I stopped for a quick breakfast and sock change and proceeded on towards Weatherford. Up until this point I hadn't encountered many people, only 4 bikers and a runner. 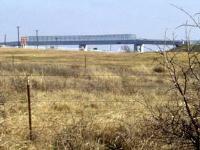 During the 10 mile stretch from Garner to Weatherford traffic increased and the trail became more exposed to the sun. There are benches placed throughout the trail every 2 miles, sometimes closer. Approximately 6 miles from the Weatherford trailhead there is a latrine as well as water for horses. The last mile and a half run alongside a lake before curving around into the parking lot. It's a very flat and quick 20 mile hike, but I cannot stress the importance of bringing enough water. Take more than you think you'll need. I consumed just shy of 5 liters. Other items that I found to be useful for the trail are extra socks, sunscreen, high calorie snacks, band aids and a basic first aid kit, cell phone, sunglasses and a few ziplock bags to waterproof any moisture sensitive items. The scenery was pleasant along the way. Lots of pastureland, farms and ranches. You will see lots of bearclaw cactus, oak trees, mustang grape vines and many other kinds of plant life. I encountered two copperhead snakes along the way east of the Garner trailhead. Stay vigilant, especially when walking through the dead leaves that accumulate on the trail. There were many different species of birds; the white wing and morning dove were my favorites. Keep your eyes open and you can spot deer, coyotes, foxes and bobcats. Overall it was a very enjoyable trail. I will be doing it again this weekend but I will explore the loop that goes into the state park. The hike through the northwest end of the park is nice and secluded. After you hike past the firing range to the west, the back end of the park is very nice. We stayed on the trail which headed north, then east and then back south along the western edge of the lake. At the extreme southern end of the lake the trail rises 300 vertical feet in the space of 200 yards. Climbing the switchbacks is fun and a bit challenging. If you don't get to the western parking lot early in the day then the horse trailers can take up a lot of space and you have no where to park. No water in the back part of the park, so bring water with you. Great morning started at 6am finished about 930am walked the horse trails still have a couple left before I have hiked all of them. only two other people there on sunday morning, saw 6 deer, could here turkey gobble, cool morning for this time of year with nice breeze. East trails are a lot prettier than west trails. well worth the drive easy family trails. I live about 30 minutes from park so I hike here when I do not have time to go anywhere else. I like the park, but only because it is close to home. Very little to see besides the old military base, but a good place to take the family. Overnight primitive camping is grown up with grass, I have never stayed there overnight but usually hike to area before taking a different trail back. If you are wanting to stay overnight I would reserve a tent site close to trails. Good place for a day hike, I usually see less than 5 or 6 people even on weekends. The trail was easy to follow and made it easy to share with mountain bikes. I would recommend this these trails to families that want to walk together without having to walk in a line. Tree coverage was at a minimum because of the time of the year, but we got lucky when the weather was fair- not too cold and not too hot. 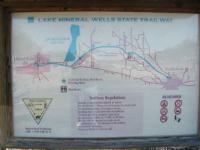 We plan to go back and try to hike the whole trailway... wow! started around 9ish.... no one on the trail until later in the afternoon.... but then only one hiking and 3 on horseback. Terraine varies from dirt and grass to sand to rocky (all on the same trail and without warning). mostly flat, but few small hills.... couple of pretty good downhill/uphills on the longer hike. Take a compass with you...maps on the trail are kinda misleading ....points you in one direction, then you come to a fork, but no map to further guide you. Penitentiary Hollow as awesome. Few Rock Climbers were out.... beautiful view and impressive rock/hill. nice view of the lake. Would definitely do again. Hiked both the primitive trail and the Cross Timbers Trail on a cold, windy winter day. Not a single person seen the entire time. Having previously hiked a portion of the Trailway, this time my wife and I decided to hike the trails in the northern part of the state park. In order to get some distance, we combined sections of the multi-use trail with the footpath and made a big loop. We started by following the western perimeter trail and returned on the eastern trails. The most scenic part of this hike is the first half mile along the foot path. The hike overall is relatively easy except for a steep hill in the very northernmost section of the park. Although we encountered no other hikers, I gave the solitude rating an average score because we could hear loud speakers from the facility to the west of the park throughout 75% of our hike.